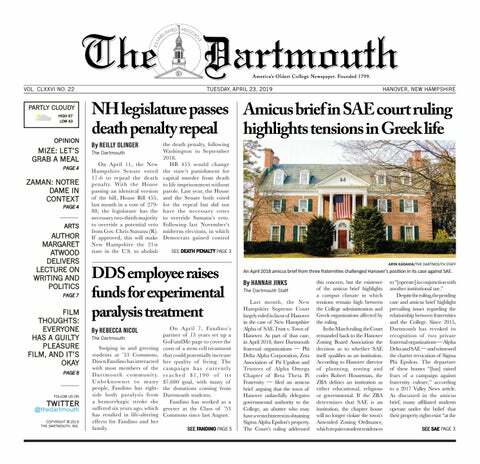 On Friday, the Dartmouth Fashion Council will put on its second annual show, the Cosmopolitan Chic Fashion Show, to display trends from around the world, including style capitals such as Milan, Paris, London, Tokyo and New York. Last spring, the group put on the Seven Deadly Sins Fashion Show, which sought to portray greed, lust, gluttony, envy, sloth, rage and pride. The sins were expressed through color palettes, distinctive textures and fabric choice. This year’s iteration of the Council’s annual show will feature more realistic fashion compared to the abstract wear showcased in Seven Deadly Sins, co-founder Randi Young ’15 said. Young said she thinks that some people are too quick to consider fashion a shallow interest. Fashion is for everyone, she said, noting that anyone may model for the show and that there is no requirement to be a size two. Through the show, the group hopes to affect student’s perception of fashion, Young said. She said that people do not need to put themselves into a “box” when it comes to dress, and that it can be beneficial to mix genres. The council, she said, seeks to give students the option to play with fashion as an emotionally expressive form. Nicolle Allen ’16, who designs costumes for productions at the Hopkins Center, said that the stage is one setting where fashion is most important. The costumes that actors wear, like the “costumes” students put on every morning, portray something about the individual, she said. Allen said that when designing costumes, she mainly focuses on the personality she is trying to convey, noting the clothing’s line, cut and texture. Young and Allen both noted that many people are unaware of the impact that their fashion can have. “Most people when getting dressed aren’t aware that what they wear is conveying something about them,” Allen said. Anna Winter, cutter-draper for the theater department’s costume design shop, said that fashion provides an “emotional experience” for both wearers and audience members. When discussing the impact of fashion on a play, Winter said that costumes help accentuate what the actor presents. The Fashion Council’s show will be highly theatrical to enhance fashion’s artistic value, Young said. Charli Fool Bear-Vetter ’15 said she plans to attend the show. “I’ve always had an interest in fashion, and I love supporting other people’s passions as well, so I really want to go and appreciate all the work they’ve put into this,” Bohtz said. At the same time, Young said that audience members do not need to have an interest in fashion to enjoy the show. Young said she conceived the show’s theme in the fall and spent winter term recruiting models and taking measurements. The show, which will take place in Collis Common Ground on Friday at 8 p.m., will feature 14 models, including Young. The council has held weekly rehearsals throughout the term in preparation.